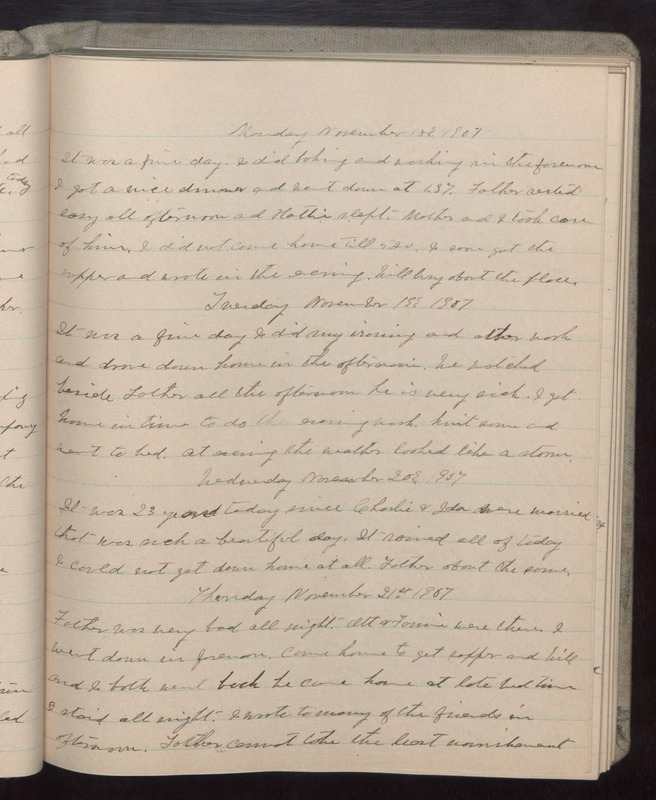 Monday November 18 1907 It was a fine day. I did baking and washing in the forenoon. I got a nice dinner and went down at 1.37. Father rested easy all afternoon and Hattie slept. Mother and I took care of him. I did not come home till 5.30. I soon got the supper and wrote in the evening. Will busy about the place. Tuesday November 19 1907 It was a fine day. I did my ironing and other work and drove down home in the afternoon. We watched beside Father all the afternoon he is very sick. I got home in time to do the evening work. knit some and went to bed. at evening the weather looked like a storm. Wednesday November 20 1907 It was 23 years today since Charlie & Ida were married that was such a beautiful day. It rained all of today I could not get down home at all. Father about the same. Thursday November 21st 1907 Father was very bad all night. Ott & Fannie were there. I went down in forenoon. came home to get supper and Will and I both went back he came home at late bed-time I staid all night. I wrote to many of the friends in afternoon. Father cannot take the least nourishment.